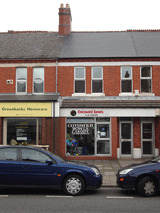 Forming part of a substantial Grade 11 Listed Building situated in the Cardiff Road, Llandaff Conservation Area being a three storey semi-detached property (plus Basement) with a two storey annexe and this flat is located on the Ground Floor of the two storey annexe. The Building is traditionally constructed of solid walls, having a cement render finish and set under a pitched timber framed roof structure overlaid with slates. The single storey Living Room extension is set under a mineral felt covered flat roof. Llandaff Place is a narrow road leading directly off Cardiff Road and gives access to the on site car parking for the property and to properties further along the road. Situated adjacent to the Portabella development on the site of the former Churchills Hotel where superior properties are currently being constructed. Within reasonable walking distance of Llandaff Fields and the short shopping parades at Cathedral Road and Pontcanna Street. High Street shops at Llandaff are a little over a quarter of a mile away and Cardiff City Centre is around one mile away to the south east. Bus services run along Cardiff Road which is a busy access road to and from the City Centre. The flat does require repair, decoration and re-fitting of the kitchen and bathroom/W.C. UPVC double glazed side screen and side entrance door. Central heating radiator. Cove ceiling. Single and double power points. Central heating thermostat control. Alarm control (working condition unknown). Airing cupboard housing the polyfoam lagged storage tank with immersion heater. 4.52m x 3.96m (14'10" x 13'0"). UPVC double glazed side screen and door giving access to the rear garden area which belongs to the Flat. Laminate floor. Central heating radiator. Cove ceiling. Triple and three double power points. Serving hatch to kitchen. 2.44m x 2.97m (8'0" x 9'9"). No door opening to the Entrance Hall. Worcester wall mounted condensing gas fired central heating boiler. UPVC double glazed window overlooking Llandaff Place access road. Range of base units with worktops and inset one and a half bowl stainless steel sink. Single and double matching wall cupboards. Plimbed for a washing machine. Central heating radiator. Cove ceiling. Three double power points. 3.66m x 3.86m (12'0" x 12'8"). Twin single glazed wooden framed windows overlooking Llandaff Place access road. Central heating radiator. Cove ceiling. Two double power points. White suite comprising panelled bath with mixer taps, pedestal wash hand basin and low level W.C.. Single glazed wooden framed window overlooking Llandaff Place access road. Central heating radiator. Half tiled walls (which have been painted blue). Cove ceiling. Enclosed garden area with gate from the communal path which gives access from the car parking area to this flat and other flats forming 2 Llandaff Place. Leasehold for a term of 999 years from 1st January 2014 at an annual ground rent of £10.00. It is understood that the owner of this Flat is entitled to hold one share (of five) in the holding company which owns the Freehold Interest in Llandaff Place. The flat has been placed in Band "F" for Council Tax purposes. The current energy performance rating is "E", i.e. 50 - Copy Certificate attached.